ENCINITAS — A long-awaited rail underpass near Santa Fe Drive and Swamis Seaside Park officially opened to the public on Wednesday after more than a year of construction. Encinitas councilmembers, other officials and the public were on hand to celebrate the debut. North County Supervisor Dave Roberts said the underpass will allow for safer access to the beach. “There were limited options for crossing legally,” Roberts said. He added that more than 50 trains travel per day on this section of the coastal rail line, making it one of the busiest inter-city rail corridors in the country. Still, many residents risked illegally crossing the tracks because there was no alternative. Mayor Teresa Barth agreed, adding that the nearest legal crossing is 1.3 miles to the south at Chesterfield Drive. 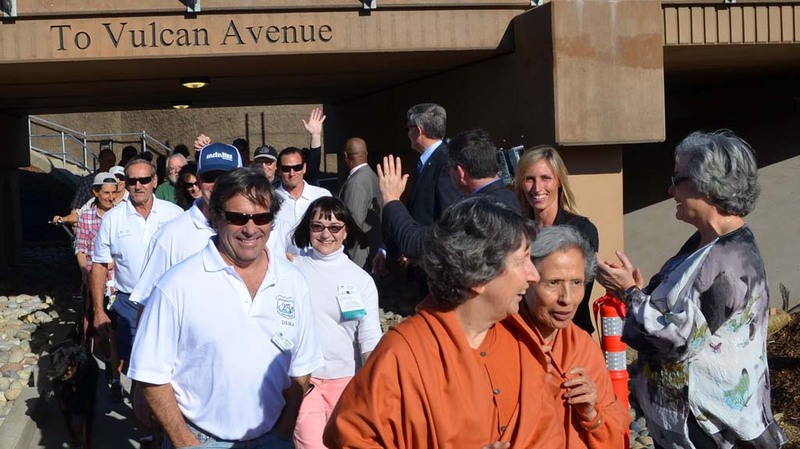 After the ribbon cutting, residents, a few toting surfboards, walked through the new underpass. Some immediately tried out the new crosswalk and traffic light near the underpass. Encinitas funded $1.25 million of the $6 million project. The rest came from a $3 million SANDAG grant, with the remaining portion from a state grant. SANDAG also plans to build two railroad crossings in Leucadia and one in Cardiff. Preliminary environmental reviews have been completed for those projects, but funding has yet to be identified, and thus there’s no construction schedule yet. All told, the three pedestrian underpasses are estimated to cost $19.7 million.